CAIRO – 16 April 2018: Minister of Antiquities Khaled El-Enany visited the Avenue of Sphinxes in Luxor on Monday to follow up on the latest updates of the project being implemented to excavate and restore the avenue. The Avenue of Sphinxes is the road that connects Luxor Temple to Karnak Temple. It is about 2,700 meters long and 76 meters wide. Chairman of the Armed Forces' Engineering Authority Kamel al-Wazir and Luxor Governor Mohamed Badr accompanied Enani during his tour. In an interview with Egypt Today earlier in April, Enany said that a new place has been determined for an evangelical church on the side of the road that is set to be removed. It is noted that only the back part of the Virgin Mary Church located on the side of the road will be removed. In addition, some houses around the avenue have been demolished in order to excavate it. Badr said earlier that people would be compensated for the demolished properties and that new houses would be constructed for them in other places. In an interview with Egypt Today last May, the head of the projects' sector at the Ministry of Antiquities, Waheed Abou el-Ela, said the road will be paved to allow easy access for visitors, in addition to moving utilities like electricity and water. The project also includes the development of the floors, the completion of the excavation and repairs to the collection of ram-headed sphinxes on the sides of the avenue. 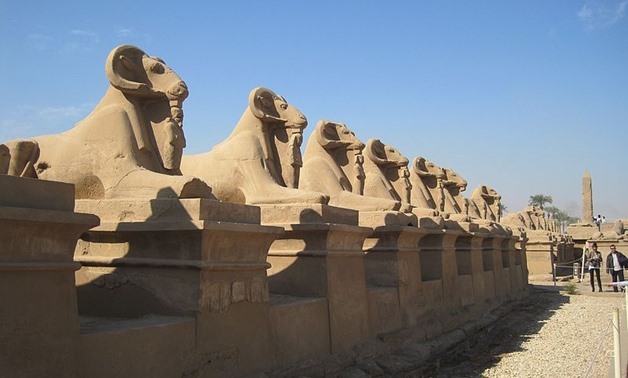 The project to excavate and restore the Avenue of Sphinxes began in 2005, and about LE 600 million ($34 million) have been spent on the project. The project was halted after the January 25 Revolution in 2011 and was resumed in 2017 after President Abdel Fatah al-Sisi gave his instructions to complete the project as soon as possible.